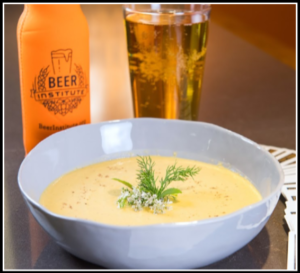 Image of Cider and Root Vegetable Soup taken for the Beer Institute. Recipe was created by Chef Laurent Aubel. In a large pot over medium heat add olive oil, rutabaga, carrots, butternut squash, onion, celery, shallots, and garlic, cook for 5 minutes then add the thyme, bay leaves, hard cider and chicken stock, bringing to boil. Reduce heat to low and cook for 45 minutes. Add in cream, reduce heat and simmer for 15 minutes. Remove from heat and add in dill, while removing the bay leaves and thyme stems. In small batches, transfer soup to a food processor or blender and puree. Pour into individual soup bowls and garnish with a dollop of sour cream.